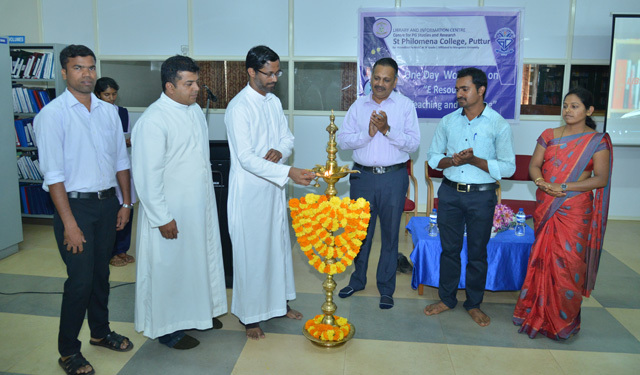 Puttur, 13 Apr: The Library and Information Centre of Post Graduate Studies and Research of St Philomena College, here organized One Day Workshop on ‘E-Resources for Teaching and Learning’ at PG Library, here on April 12. The chairman of the PG Centre Fr Dr Antony Prakash Monteiro inaugurated the workshop and delivered the presidential address. The librarian of SDM Institute for Management Development, Mysuru - Dr Sunil M V participated as the chief guest. In the two technical sessions, Dr Sunil M V presented on ‘Access and Use of E-Journals for Teaching and Learning’ and ‘Database for Research and Publication’. All the Post Graduate faculties of the College have participated as the delegates in this workshop. The librarian Nutan Kumari and member of library advisory committee Praveen Prakash D’Souza coordinated the Workshop. Prathibha S G and team presented the prayer song. The convener of library advisory committee Fr Rithesh Rodrigues welcomed the gathering. The librarian Manohar S G proposed the vote of thanks. Ivy Anjali compered the programme.